This post has been a long time coming! Phew! I posted a video tutorial 3+ years ago on a machine I considered to be the best sewing machine for beginners then. Well, shortly after that video went up the manufacture stopped making the machine. So, I have been searching high and low since then to find what I consider the best sewing machine for a newbie and I’m happy to announce… I finally found it! As I usually do when I get my hands on a new sewing machine I filmed a full video review to tell you all about it, what it can do, show you sample stitches and I even share with you two projects I made with the machine. If you know my video reviews you know I love to test sewing machines on denim. To find out exactly how many layers of denim this baby was able to sew through make sure you watch the full video review. For this video review I teamed up with Sew Vac Direct and they have been generous enough to offer up the sewing machine I used in this video review to one lucky viewer! BONUS: I’m autographing it for you and shipping it to you myself! Keep reading for details! I tested the Janome 2212 on a mini quilt project and it passed with flying colors! Note: This is the sewing machine that I consider to be the best for beginners. I prefer to have beginners start off on a mechanical machine instead of a computerized one. So, although you may find some computerized machines on the market at the same price point as this one I, personally, still prefer the Janome 2212 I feature in this video for a beginner. In my experience mechanical machines can withstand a lot more wear & tear and can sew through multiple bulky layers a lot better than a computerized machine in the same price range. If you decide to purchase a Janome 2212 I would appreciate it if you used this link to purchase it from Sew Vac Direct HERE. I do not earn any money from your purchase but I was compensated by Sew Vac Direct for creating this video review. I chose the machine and all the thoughts and opinions represented in this post and video review are my own. Thanks for your support! 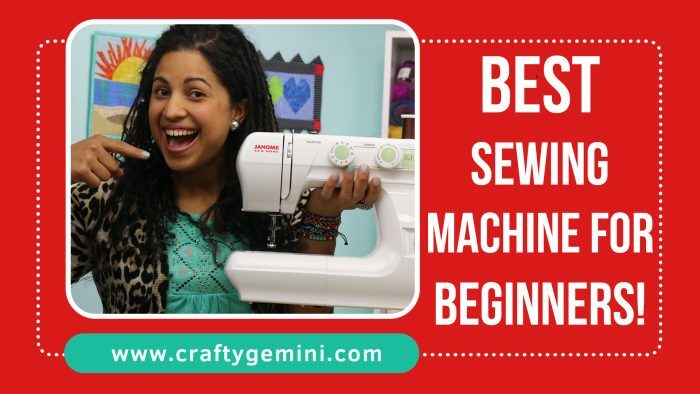 Now I’ll leave you with the video review of my pick for 2016 BEST sewing machine for beginners! For your chance to enter the giveaway please use the Rafflecopter widget below! Perfect machine to take on retreats and share with my daughter! Love it! Hi Vanessa – I agree, great machine for beginners or for traveling with a machine. hi vanessa i love the machine very much . I will be teaching a mother and daughter to sew this summer. Sure could use another machine so I can teach them at the same time. my daughter just got married saturday and was asking for a sewing machine. she only learned a little in school. she was never interested when i was sewing as she grew up. but now she is, so i was planning to get her one for a wedding gift. i think this one would be perfect. Looks amazing machine, lightweight compact and perfect. My son who has autism is learning to sew and him having his own machine! Would be a dream come true. Unusual for this type of child wants to sew! So want to encourage and give him his own machine! Money so tight (have two children with autism ) so can’t afford one. So it wold be fanatic. Thank you for the opportunity to enter! All the best! I would love to win this for my granddaughter to start teaching her to sew on it. I just came across your youtube channel last night and I am very excited to share you with my daughter. She is 11 and has been taking a private sewing class for the last year every Tuesday. I picked her up tonight and they told me her machine is broke. It will only sew straight. I think it’s Ironic that I just got this notification. I watched the video and it was really helpful. I can’t express how grateful we would be if we won. I don’t personally sew but I did watch some of your video’s last night… Jada is going to love you!!! Looks amazing machine, lightweight compact and perfect. My son who has autism is learning to sew and him having his own machine! Would be a dream come true. Unusual for this type of child wants to sew! So want to encourage and give him his own machine! Money so tight (have two children with autism ) so can’t afford one. So it wold be fantastic. Thank you for the opportunity to enter! All the best! Really loved how the crafty Gemini explained and showed all the ways u can see with this awesome machine.would love to win this one .thank you . I am a mentor! I will be teaching simple projects to young teens…it will be great to introduce them to a nice simple machine that does so much! Loved the video. Amazed at the number of layers used for denim fabric. You are a Godsend with your informative and detailed instructions. Congrats on your new ventures. I would love to own this Janome to take to classes!! Awesome machine and you are great at explaining everything so anyone can follow along no matter what their sewing background is. A very impressive little machine. TFS! This machine is so much like my first machine; it will be so easy and so much fun to teach my granddaughter to sew with it. Thank you for the chance to win it!! Great and informative video! Thank you! I am a newbie sewist and this would be great to have! My daughter made her first “mini” quilt on my old machine. I would like to get her one of her own and have my son use my Kenmore. Thank you! Granddaughter starting college in fall with a major in marketing and fashion merchandising. She is hoping to job shadow and certainly could use a machine like this one. I taught her how to sew and has gone on to state fair with some of her 4h projects. Nice machine! Grand daughter heading off to college in the fall. Fashion merchandising/marketing. Hoping to job shadow while doing her studies. I taught her to sew when she joined 4H and continued onto state fair with some of her projects. Would be a great machine for her. Love it, would be perfect for me! Great starter machine for my granddaughters. I already own 2 Janome machines, and this one looks like a great, light-weight machine to use for piecework quilting while attending workshops and retreats. I’m new to sewing and I recently just started trying to make clothing because my daughter has boy/girl twins. She is a single mother so I try to help her all that I can. I really need to win this! With a friend, I will teaching sewing at OMOM in Memphis. would be very helpful as we are looking for 10 girls to start. Would love to win this machine, so I can take it to classes and retreats, and along on vacations.. Watched Vanessa all the time, and love her tutorials! I love this machine. Thank you, I have been looking for one light weight to take to class/guild. Also looking for one for my granddaughter who will be 3 soon. She loves to help me. This would be perfect for her. I’m a year old into quilting. This machine looks perfect and looks portable to take along to classes! Great beginner machine. Would donate to a woman’s charity to help someone become self-sufficient. I would love this beginner sewing machine for my 8 year old daughter. This would be a great project for her this summer. I want to start her sewing training early so I can see her progress throughout her growing up. I love how you start your kids early and see the passion they have for it. I want that for my daughter. Crosses fingers I win this!!!! I love this to take to classes. It’s simple but does everything you’d need. Thank you for in ding this great giveaway. I would love to win this for my daughter to learn how to sew. Id love to win this so that I can once again sew. I cant afford to purchase a new one & Im disabled & a shut in. This is a phenominal looking machine that would be easy for me to lift without hurting myself. Ty, Vanessa!! Blessings to all….. This would be a great machine for my 12 year old since she is new to sewing!! Thank you for this generous giveaway, Vanessa!! I just entered and did all the entires. This would be a dream. I’m a new beginner sewer and can’t afford my own sewing machine! This would be a great machine for my thirteen year old granddaughter. She has been interested in sewing for four or five years. 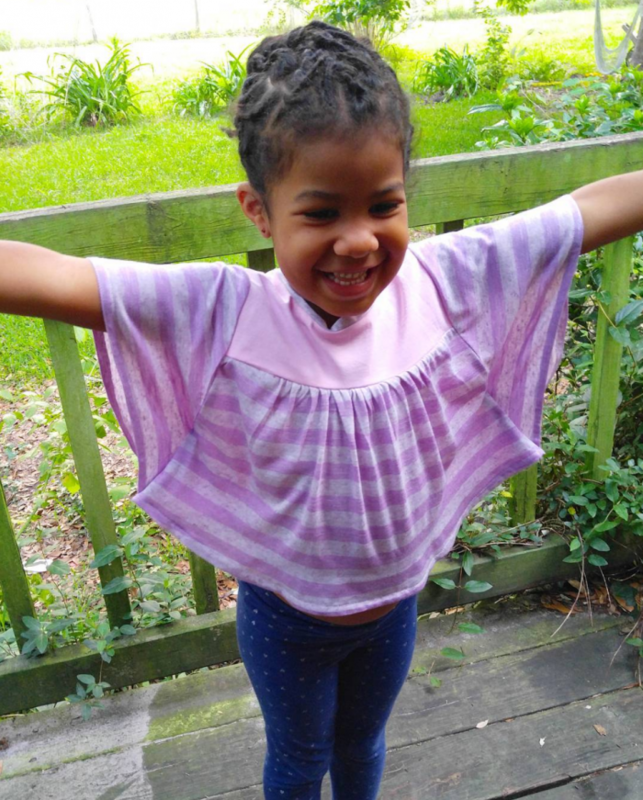 Has made shirts and doll clothes. Hopping she will one day be interested in quilting. This would be my first Janome. I love basic machines and this would be the perfect machine for me to teach my grandchildren to sew on. Thank you for teaching me to sew Vanessa!! Time to teach my grandbabies all you taught me. ???? I had a beginner level Janome when I first started sewing 3 years ago which I passed on to my sister last year when I upgraded to a computerised Janome. I also love my new machine but miss the ease of taking the lighter one to classes. This new model would be perfect for my quilting classes. I had gotten each of my granddaughters a machine that you reviewed several years ago for Christmas and they love it. I wasn’t able to find another for myself. I’m finding as I get older I’m not able to lift my computerized machine to take to classes, church or over to someone’s house for a sewing day. This machine would make it possible to do these things again. Thank you for another great review. Thanks for an awesome giveaway Vanessa!! Great review Vanessa! It looks like a really nice machine. Great review! I would love to win this machine! Thanks! This would be a great beginner machine for my daughter! It would be a blessing if I won the machine. I will donate it to the Men’s shelter where I teach basic sewing and craft projects. We currently have 2 machines (one of them is mine) and it takes a while for the men to complete a project. I love create. And I hope Won. If won the machine is for my daughter. Hi! Would love to have a starter machine. My granddaughter is wanting to learn to sew. I would love to have this 2212 to start her off with…:) Just to make memories!…..
Hi Crafty Gemini. I love your tutorials. They are clear, clean and precise just like Jenny Doan. I have been a puppeteer since 1971. As you can probably guess, I have been through several machines. Because of the travel, packing and unpacking, I chose to only buy the cheaper ones so i wouldn’t be so worried about wasting money. But I guess I was wrong because they are all broken or worn out. They only lasted one year or less. So, I will have to confess and say that I have probably wasted $1,000.00 or more. I could really use a more durable and dependable machine to stay at home Just like the one you are teaching about. Thank you in advance if I am chosen. But if I am not chosen, I choose to celebrate with the one you wins. Thank you again. I am 60 years old and have a very frustrating, rickety old machine. It tends to be very finicky;either ruining whatever I am trying to sew or barely getting thru the fabric and holding the stitches together. I am 6 ft tall and frequently have to alter just about anything I wear whether pre-purchased new or used clothing or making from scratch. I would LOVE LOVE LOVE to have a new, easy to use machine that is not complicated but does good quality work. Thank you for the opportunity to enter this giveaway. I would love to win this starter machine and give to my friend who has taken up quilting on my sewing machine. Love my friend, but would be nice if we could sew together at the same time! Thank you!!! Great video, would love this machine for my daughter! Wow, so simple! Loved the top! This would be the perfect sewing machine for my granddaughter who is 10! I love passing on the love of quilting and sewing to the next generation! I will keep my fingers crossed…thanks! I love your tutorials and watch them daily — some more than others. I teach sewing and quilting and this machine would be great for my students to use. I cannot find where to enter the giveaway, so hopefully this will be added to it. Keep the tutorials coming. Some day I hope to be able to travel to one of your retreats. I have 5 grandchildren learning to sew and quilt. This machine would be perfect for my 8 year old granddaughter. When they come over to visit they always ask to do a project on Oma’s machine. It would be wonderful to be able to say she could use her own machine.Thank you for your videos. The girls have made several projects from them including the headbands and baskets. This machine looks like it would be ideal for teaching beginners the many different uses. Perfect for the beginner! My granddaughter would love it! I purchased a Janome for my younger daughter that is for a young child, around 7-8 years old. I’ve heard nothing but great things about it and want to get one for myself. My BFF’s granddaughter is learning how to quilt from me so if I were to win this machine I would gift it to her. She is 11 years old and has been bitten by the quilting bug. Awesome. I’m new to sewing and this machine would be great to start with. Wow this the perfect machine for me nice review too thanks for sharing hope I win one. i would love this machine for my granddaughter, Dylan to carry on the tradition. I recently got into sewing. I’ve had a machine in storage that my mother gave me over 10 years ago. She told me that it was broken and to take it to the repair shop. I recently took it out and found that the bobbin gear is cracked. The repairman said parts aren’t made for this machine anymore since my parents got it in Japan in 1980. I really hope to win this machine because I want to start making my own clothes. I didn’t even have a twitter account before this contest but I created one just for the point to win. I really want this beautiful machine.the first thing I would make is the lovely easter basket to use for my sewing equipment I’ve already purchased. Those pockets are such a great way to store scissors and fabric pens. Whom ever wins, congratulations! #craftygemini I think your so awesome and well rounded. You aread such a positive influence on everyone in everything you do…definitely shows with your family! Love watching you. This machine looks like a workhorse, you can sew about any material you want. A great machine for anyone. Love your site and videos, so much detail is given and it’s perfect for a beginner like me! Thanks for the giveaway! Looks like it would do just about any job a sewer would need to do, be it making clothes, quilts, hand bags totes or any thing else that a sewer would want to make for friends or family. Would love to win this machine as I have an 8 year old granddaughter who loves to sew and is learning to make her doll dresses and quilt. This machine would be a great gift for any age. Thanks so much! Just what I needed to find a machine for my granddaughter! Love it! I’ve been searching for months on a machine….this should fit perfectly with me! THanks for a great tutorial video! I’m teaching my darling daughter in law to sew- what a perfect gift for her! This machine will make a perfect first time machine for young sewing beginners. I love the simplicity. Looks like a perfect machine to help me teach my grandchildren to sew. Would love to have this. I’ve had a Janome for about 15 years and love it. Love it. Will give it to my daughter. Perfect machine to teach my daughter to sew! being they get picky as they get older. Thank you for the opportunity to enter this sweepstakes! Nice. Mechanical machine….you did a great job reviewing the machine. I would love to surprise my sister with this machine as she has been wanting to try her hand at sewing as she sees all the wonderful things I sew and have made for her and she loves them! I would love nothing better than to surprise her with her very own machine to get her started on her way to making amazing items that she can be proud of! I would love to try this brand. Love to quilt. 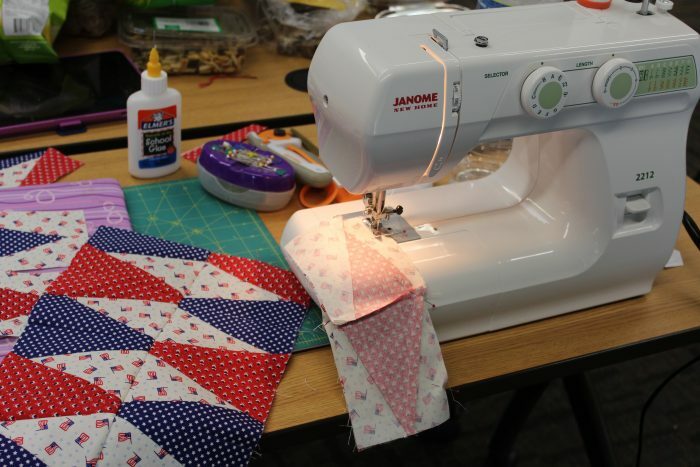 Great tutorial, I would really love to win a Janome, it looks like a high quality machine. Have a fun Holiday. I hope we Canadians can enter and I sure hope I do ,I follow your videos every day and tell everyone I know to watch you you are great,thanks for all your informative videos. Great giveaway! You always have the best products in review! Like some others, my poor machine is old and can’t keep up! You have so many projects I have made on my machine! Love it! A good machine, love it. Great sewing machine, my granddaughter could make use of this. I learned to sew on a Janome. They are a great quality built machine. You are so right about learning on a mechanical machine vs computerized as a beginner might have their machine a long time too. Would really like to win this to give to my granddaughter. Looks like just the right one to get her started. my Dream machine. Great Giveaway. Thanks so much Vanessa for this product review. I hope i have a chance to win. All the best to everyone entering. Thank you for all of your searching, we trust our opinion. Am looking for a workhorse for sewing charity quilts and this may fit the bill. I gave my granddaughter a sewing machine for Christmas a few years ago and she has really taken to being creative. First she made clothes for her American Girl dolls, and now she makes tops for herself. Problem is, now my grandson wants to learn to sew and I KNOW this Janome would be a great starter for a boy! I’ve been making your double oven mitts using your tutorial and have made at least a dozen. Greatest gifts ever, and have even sold a couple. I also have your 10″ slice template and plan to use it to make the Lava Lamp quilt. Would be so happy to get lucky and win that Janome……….. I would like to get my 7year old granddaughter a sewing machine like this because she has shown an interest in sewing. Would love to win this sewing machine for my grand daughter. This is a perfect machine for my daughter in law that is new to sewing and would love to make a comic con costume!! What is the Rafflecopter widget? This machine is a great choice for beginners. Great beginning machine for my granddaughters! I would love to win this beauty. I am definitely a beginner and I’m learning slowly but surely! Good luck everyone! I have a Janome machine that is about 22 years old that is so similiar to this one, lol. I have used it over the years but have also upgraded with several newer models of Janome’s. Would love to have this little machine for my Grand daughter. Thank you so much for this video! I have been sewing for over 50 years and have 2 machines (my “old” Featherweight that is over 60 years old and my “new” Singer 2001 Touch Tronic that is nearly 40 years old). I wanted to get something new but had no idea where to look and I didn’t want to spend hundreds and hundreds of dollars. The Janome 2212 is PERFECT for me! Even though I have been sewing for many years, I don’t need a fancy machine. My old 2001 has been acting up quite a bit and I have actually put over $200 into it over the last year or so. Had I known I could have bought a replacement for less than that, I would have jumped at the chance. Now I know, and my new machine is on it’s way. Times have changed so much – This $150 machine will do everything my 2001 does (and it cost over $1,000 when I bought it back in the ’70s! Thanks again and Happy Sewing! YAY! I’m so happy to hear that, Gail! Glad to help! Did you order your from SewVacDirect by any chance? If so, you are probably getting the little bonus pack of bobbins, needles and 1/4″ foot. Vanessa – I just received my machine (yay!) and I did receive the bonus bundle with bobbins and needles, but there was no 1/4″ foot. I just wanted you to know to avoid disappointment with anyone else. Thanks. I haven’t used a sewing machine for 40 years! I would love to have a Janome to make quilts for my children and grandchild. Very helpful video…..thanks! Really looks like a sweeeeet sew!! I totally agree with you on the many capabilities of this little workhorse machine. I’ve used SO MANY of your easy to follow tutorials and am always anxious for new ones…Wishing ME luck on winning this Janome Sewing Dynamo! This a great machine! I’d love to win it for my son who wants to learn to sew and loves to watch your videos! Hi, Vanessa. I would love to get this for a friend who is learning to sew. Thanks. love your Janome 2212 review. this will be perfect machine for my 12 year old who is learning to sew. You’re talented, creative, and you’re generous, giving away a sewing machine. I want to make different stuff with that sewing machine if I win. Congratulations to Sonia M.. I actually posted comment after the winner was announced. L.O.L. so please how can i join your giveaways …im just a beginner in sewing but i dont have my own sewing machine ,thats why im saking how to join …by the way im from the philippines ,i dont know why but i love sewing thats why im your fan always watching your youtube videos…..its amazing to have some sewing machine like janome 2212 but here in the philippines there is no machine like that…i like that machine….